In a stand mixer, beat the heavy cream until soft peaks form. Add sugar, slowly combining until well integrated. Spoon 4 tablespoons of the mixture into a small, covered bowl. Set aside in the fridge. To the remaining mixture, add cocoa powder, vodka, Irish cream, and Kahlua. Mix again until well combined, about 30 seconds. Transfer to an airtight container and refrigerate overnight. Place Zoku bowls in the FREEZER overnight. When ready to make ice cream, remove Zoku bowls from the freezer. Pour half of the mixture into each bowl. Stir constantly for about 10 minutes, or until the mixture chills and thickens into soft-serve gelato. Top with the reserved sweetened whipped cream, a drizzle of hot fudge sauce, and chocolate sprinkles. Serve immediately! This delicious recipe requires two Zoku Ice Cream Maker bowls. It can also be made by freezing it in an airtight container overnight, stirring every 2-3 hours to keep the mixture soft and fluffy as it freezes. This boozy adult-only gelato is a creamy, dreamy, soft-serve summer treat. Ever notice how things sound better when they’re boozy? Boozy cheesecake. Drunken noodles. Tipsy tacos. These are things you just want in your face. Now. So, we got a little glad around these parts when we discovered Zoku’s new Ice Cream Maker bowl. 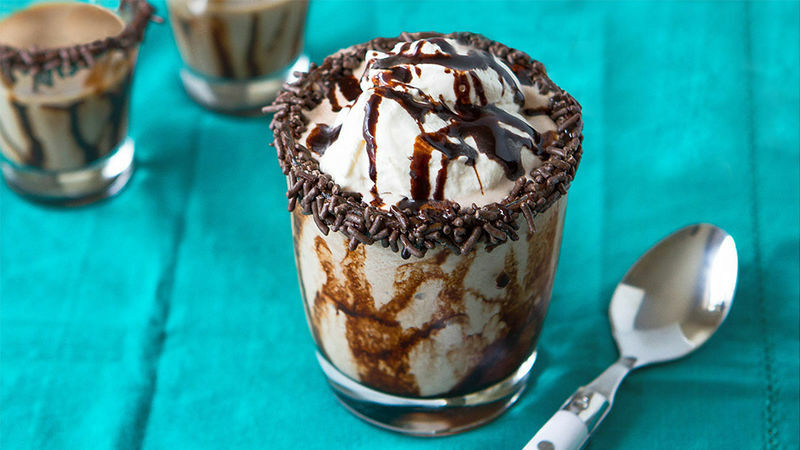 It’s basically so easy to use, you can make ice cream from scratch ... even when you’re boozy. The snazzy little personal ice cream maker works like this. You open the box to find the pretty bowl. You just freeze the stainless steel part. Then mix up your gelato. I chose to make a Mudslide Gelato. Because ... Bailey’s, Kahlua, vodka, gelato. We be like that. Just mix it all up. Take the bowl out of the freezer and pour in the gelato mixture. The Zoku bowls come with a cute little stirry-spoony thing. So you basically go round and round 'til the mixture freezes. Pretty soon, it looks like this. Drizzle the top all up with some whipped cream and drizzle chocolate drizzle. Or, if you're sharing, you can put it in cute little glasses rimmed with chocolate jimmies. Freezy boozy never tasted so good! No matter what you serve it in, you'll want to get this luscious stuff into your mouth right NOW.